The Third and Final WeAllSew Challenge Starts Soon! Our first two WeAllSew Challenges, the “Wedding Dress Makeover” and “Make Yourself at Home,” were a lot of fun with a ton of wonderful project creations from our challenge participants. Now the time has come for unveiling our final WeAllSew Challenge. So be inspired to break the spell of routine Halloweens! We challenge you to dig into your closets and find the scariest, most embarrassing items from your wardrobe, and then upcycle them into a shockingly-chic costume to enter for a chance to win a $1,000 BERNINA Gift Certificate, plus a chance to be featured on WeAllSew.com. And remember – all challenge participants will automatically be entered in the WeAllSew Challenge Sweepstakes Grand Prize drawing for a chance to win a BERNINA 730 E sewing machine! So far this year BERNINA USA has hosted two unique challenges that focus on upcycling or reinventing pieces of clothing and fabric. For each challenge, one winner was selected to receive a $1,000 BERNINA Gift Certificate. Our third and final challenge is open for entries, with another chance to win a $1,000 BERNINA Gift Certificate! 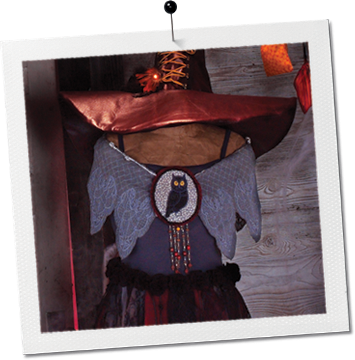 To upcycle your very own wardrobe disasters into a chic Halloween costume to enter in the third and final WeAllSew Challenge, visit our WeAllSew Challenge page on Facebook for instructions on how to enter and full contest rules. Upload a photo of your finished project along with a brief description to our WeAllSew Challenge page on Facebook between Thursday, September 6 and Monday, September 24. “Break the Spell of Routine Halloweens” is the final of three challenges on our contest schedule. Your challenge entry will be judged by a panel of BERNINA experts based on three criteria: The number of votes each project receives, the project description, and the photo of the finished project. The winner will be announced on the BERNINA Facebook page in early October, 2012. Additionally, anyone can enter to win the grand prize drawing for a BERNINA 730 E sewing machine. Simply fill out an entry form at your participating BERNINA store to enter. Each challenge participant will be automatically entered into the drawing, which will take place in September after all three challenges have ended. Get your sewing machines ready! We are looking forward to seeing how you will break the spell of routine Halloweens!